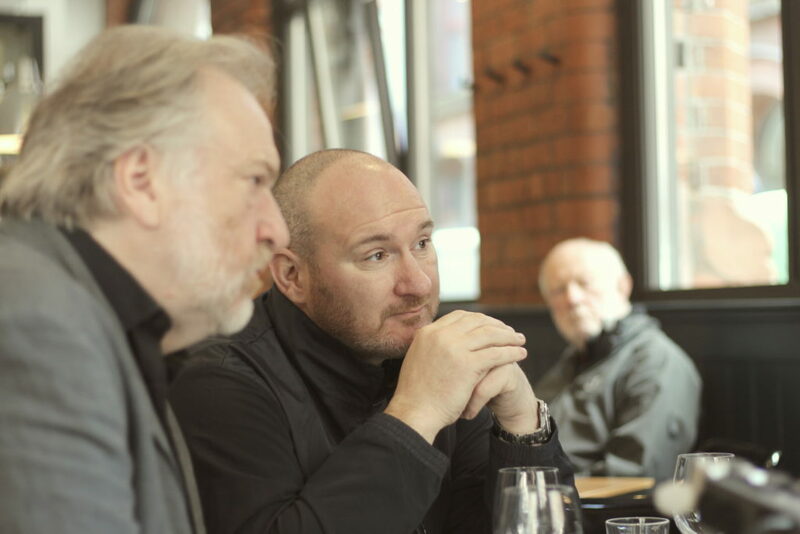 “The best buildings are the product of an empathetic relationship between the client and architect” – architect Aidan McGrath of McGonigle McGrath (left), with restaurateur Niall McKenna (centre) at McKenna’s James Street South Bar + Grill, Belfast. 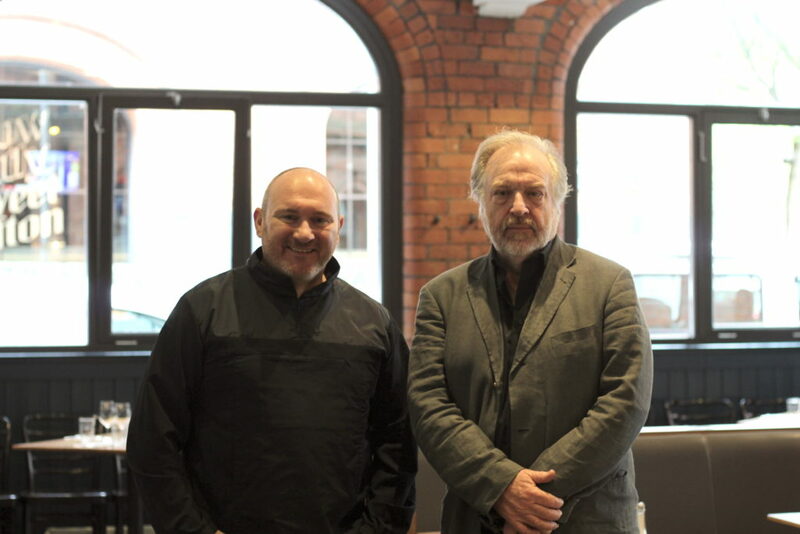 Barrie Todd, founder of ask an architect, pictured right. Photo: Maria Postanogova. This conversation took place at James St South Bar + Grill, Thursday 10th May 2018. How did you get started working together? Niall McKenna: I first met Aidan at the first Roscoff fit-out and that was a long time ago. So, I was only a cub of 18 and even then I knew that he was something special. It’s Aidan’s reputation and the architectural style that he has – that’s what drew me to working with him. Aidan McGrath: Our first project was Roscoff, then Cayenne, then James Street South and more recently Hadski’s and the James Street South Bar + Grill. Each time you learn a little bit more and gain a little bit of experience. Does your own style and taste come through in the restaurants? NMK: Personally, I really do like the minimal look, but at the same time it’s down to what the customer wants and the market you’re in. Not everything we do in the restaurant is my personal style – it has to be commercially viable. AMG: You have to be constantly aware of the public. You can take the public along with you a bit, but sometimes you have to follow them also. What kind of space do you need to think about when designing a restaurant? AMG: There are a couple of fundamental things. We always consider volume and space to be a luxury: let’s go for tall ceilings and height and volume. But along with that come acoustic issues, so you can get a hugely impressive space in which you can’t hear yourself think. I think the scale should be humane, so that people don’t feel daunted or intimidated by the scale of the space. You wouldn’t want to sit in the King’s Hall or the SSE Arena to have your dinner, you want something much more intimate. So in terms of scale, it’s about humanity, it’s about trying to make it something that people can fairly readily identify with. NMK: From our point of view, it’s about the flow of the restaurant, how the floor works. The practicalities for me as a restauranteur, for our staff and the customer. Normally I’d let Aidan design and then we’d tinker afterwards, because Aidan understands exactly what the restaurateur needs, and to me that is the key thing. It’s one of the things that a lot of people get wrong when it comes to restaurants. They go fully “design” on it but don’t look at the practicalities of the business – working with someone who has the expertise that Aidan has, he gets that straight away. To what extent can you design the atmosphere of a restaurant space? AMG: To some extent it’s intuitive – which is great when it works and a disaster when it doesn’t work! You are constantly researching. You visit other spaces, you visit other restaurants, you make a mental note – and sometimes a literal note – of spaces and rooms that delight you and that you think might be worthy of some closer examination. NMK: To me it’s the subtle things, from entrances, to seats, to the height of tables. It’s trying to get as much into the space as possible that is interesting. I love eating, love wine, love traveling, and to me you’re always learning something, you’re always seeing something new. You’re always thinking, “Oh, would that work in Belfast? Would that work here? Would that work in James Street South? Would that work in Hadskis?” And, that’s where I think design is a great thing. It doesn’t necessarily have to be a restaurant, it could be a museum, it could be anything. Most of the projects you’ve worked on have been in older buildings – what is the attraction? NMK: To me it’s about the area. When we first opened James Street South, it wasn’t in a nice street – it was in a backstreet, we had a hostel at the end of the road. But, to me it was attractive, because I like being on the backstreet, I love the dinginess of it, but at the same time I love the facade of it. AMG: One of the attractions for us about buildings like the one that holds James Street South is that it’s inherently a Belfast building. I think the key is getting the public into these buildings for whatever function. This building has got that red, Belfast, Victorian brick, so you’re not trying to create an image, the image already exists and it’s a powerful one. And too frequently around the city people hide it, or plaster it, or put fake stone in front of it. But here it is – we’ve exposed it and people that come in enjoy it. Visitors recognise it for being what it is. There are challenges working in older buildings like this, but I think that the rewards are greater than the challenges. NMK: When we went inside it was totally bare, so being realistic, other than a couple of poles, supporting beams being in the restaurant, off we went. As soon as I walked in I knew how it was going to be designed: there’s the kitchen, there’s the toilets, there’s that and we’re done. Aidan then comes in and says, Right, this is what we’re going go do and nine times out of ten it’s exactly the same. And then Aidan does his design on it. Within Belfast there are so many beautiful buildings. In my personal opinion no red brick building in Belfast should be knocked down. To me good design is good design and being realistic, if you’re a good enough architect you can design that building and keep the heritage in Belfast. Can we expect more new restaurant projects from you both in the near future? NMK: Within Belfast we’ve just taken over a building on Hill Street. Waterman House is our next project and we’re moving the cookery school there from James Street South. We’re making a food offering somewhere in the building and the rest will be rented out. To me it’s a very interesting building, it’s a beautiful building, it’s a great street, I think the facade of the old listed building is wonderful. You go into a warehouse and then you go into a square brick building at the back with a flat roof. AMG: You have to nurse the project along because to some extent it’s dictated by the building. There’s no point in trying to shoehorn a function into it, or a type of activity into that isn’t appropriate to the building. We’re all getting to know the complex of buildings. NMK: I think it’s interesting – there’s longevity to that building, it’ll be a few-year project. It comes down to how much money can you afford to throw at it from a business side. But we’re going to do it and we’re going to do it slowly and hopefully we’ll do it right. What advice can you share for business people thinking about working with an architect? AMG: One thing I would say, I think that the best buildings are the product of an empathetic relationship between the client and architect – and even the contractors. Architecture tends to fail if one party is forcing an opinion on another. It becomes about ego – and not about the result. NMK: Aidan comes with the design and we come from our side as restaurateurs and there’s a backward and forward, backward and forward. It comes down to cost, how far you want to go. But at the end of the day, the design usually wins because you realise it’s going to work. McGonigle McGrath Architects are participating in the 2018 edition of ‘ask an architect’. Until 20th May 2018, clients including homeowners and businesses can get a one-hour consultation with any of the 52 architecture practices taking part in ask an architect throughout Northern Ireland, in exchange for a £40 donation to the Friends of the Cancer Centre.